Isn’t It Time for Real Reform? Although parity legislation has passed almost everywhere, a new mental health funding disparity has emerged, Disparity 2.0. Psychiatric hospitals are closing. Mental Health Provider reimbursements are well below the level of those for physical health care. Treatment rates are flat or falling. The cause of Disparity 2.0 is the current U.S. health insurance system that relies on multiple insurers who cover the population with a series of temporary health insurance plans. The only funding systems that have parity for mental health and physical health are single, unified, and transparent systems. It is time for mental health advocates to campaign for a real system change. Reimbursements for psychotherapy services have been stagnant or falling for 20 years, psychiatric hospitals are closing, and funding for public mental health services are being cut. Legislation requiring parity for mental health services has passed in most states and the federal government, so a person would think that mental health services would be accessible, patients would be receiving quality services, and mental health professionals would be thriving. Instead of real parity with physical health care, mental health has unfortunately merely transitioned to a more insidious form, Mental Health Disparity 2.0. With Disparity 1.0, insurance companies overtly restricted mental health services with high copayments and both annual and lifetime limits on treatment. With Disparity 2.0, insurance companies covertly remove the funding needed to maintain a quality mental health infrastructure. The common theme in both Disparities is that insurance companies underfund mental health services to create a financing disparity between mental health and physical health. Indications are that funding for mental health will continue to remain flat or decline. When potential solutions are analyzed, the only realistic solution for adequate funding for mental health is a single unified, transparent health care system. It is time for mental health advocates to join forces with the larger health care reform movement to develop a system that has true parity between mental health and physical health care. What does Disparity 2.0 look like? The word “parity” means equal, and the parity movement calls for equal financing of treatment for physical and mental health care. Real parity would have meant that insurance companies managed mental health and physical health equally. Insurance companies continue to more aggressively manage mental health funding than physical health care funding, and the result is a shortage of psychiatric hospital beds, inadequate reimbursement, excessive administrative expenses, and poor outcomes. Higher out-of-pocket costs for copayments and deductibles for mental health services than required for physical health care services. National shortage of psychiatric hospital beds due to underfunding of psychiatric hospitals. Lifetime and annual limits set lower for mental health services than for physical health services. Reimbursements to providers continuously decline in real dollars and result in mental health becoming arguably the most underpaid area of health care. Only 44% of premium dollar reaches mental health providers, as opposed to 80% of premium dollar for physical health care providers. Deteriorating quality and accessibility ignored by established professional organizations and health care economists. The most dramatic result of Disparity 2.0 is the closing of psychiatric units across the country in spite of a need and demand for more psychiatric inpatient beds. It is not only mental health advocates who call attention to this deficiency. The nationwide shortage of psychiatric inpatient beds has become so severe that the American College of Emergency Physicians has extensively documented how it is impacting the country’s emergency rooms. Because psychiatric beds are unavailable, ERs are routinely holding and boarding psychiatric patients for days at a time waiting for an open psychiatric bed. How is Disparity 2.0 responsible for the shortage of psychiatric hospital beds? The answer is found in understanding reimbursements and cost shifting. Cost shifting occurs because public health care (Medicaid and Medicare) reimburses less than the cost of operating a hospital, and therefore, hospitals need to shift the cost of operation to health insurance, which reimburses more than the cost. For example, in 2007 the Lewin Group found that in Colorado Medicaid pays 65%, Medicare pays 75%, and insurance pays 131% of the cost of hospital services. When these three sources are added together, the combination of overpayments and underpayments allows the hospitals to break even. Insurance companies manage mental health in a different, “separate, but unequal,” manner than physical health care. Mental health is regulated aggressively by managed behavioral health care (MBHC) entities. The Denver Post reports that hospital directors say the psychiatric units are closing because, even when patients have insurance, the MBHC entities do not even cover 100% of the cost of care on these units. The MBHC companies simply refuse to cover the cost shifting, which insurance covers for physical health care, even though needed psychiatric units are closing. Because MBHC closely monitors and limits the length of stay, the income of hospitals is further impacted. As a result of decreased length of stay for insurance patients, the portion of inpatient beds paid by private insurance is steadily falling and the portion paid by Medicare is steadily rising. When both public health care and insurance pay less than the cost of care, hospitals must eliminate their psychiatric hospital beds even when there is demand and community pressure. With the units closed, patients may be boarded in emergency rooms or jails, discouraged from trying to obtain services, or discharged prematurely so that triage workers can admit other patients to the limited hospital beds. Market forces would suggest that as there is a need or demand, more psychiatric hospital beds would be created. The health insurance system, however, creates a dysfunction in market forces, and prevents the creation of the needed mental health treatment infrastructure. Disparity 2.0 has a more insidious impact on outpatient services. Some features of the discriminatory and excessive management are obvious. Patients are screened by a special mental health preauthorization and referral system, frequent recertification requirements keep treatment under the constant vigilance of the managed mental health care entity, and appropriate or recommended therapists are often not available within an insurance panel. Not obvious to patients, there is a pattern of declining reimbursement rates for mental health providers over the past 20 years. Consequently, mental health professionals have arguably the worst reimbursements in health care, and many are leaving the field or working outside of the health care insurance system. Indeed, spending on outpatient mental health has been flat or declining at a time that parity would have suggested mental health services should be more accessible and therefore increasing. Gordon Herz examined billing service information, Medicare reimbursement schedules, and Psychotherapy Finance surveys in order to track 20 years of psychotherapy reimbursement. He compared what insurance companies call “usual and customary rates (UCR),” with the “real usual and customary rates” that providers are actually charging in the community according to the billing service. In most states, insurance companies have such wide latitude in determining their own UCR rates that the term merely means what the insurance company is willing to reimburse, not a term that is referenced to real reimbursements in the community. UCR should be called just “reimbursement rate” rather than the inaccurate term “usual and customary reimbursement rate.” The results of Gordon Herz’s research are displayed in Figure 1. 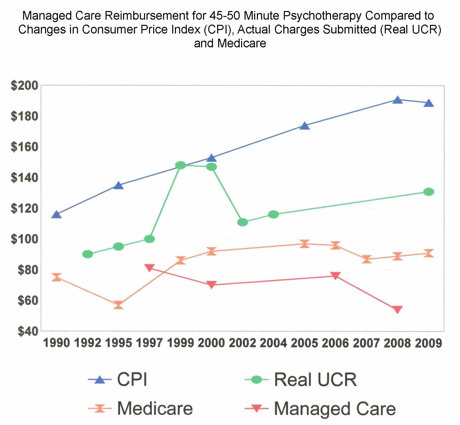 Since 1990, inflation according to the CPI increased from $116 to $189 (63% increase), yet the average amount that MBHC reimbursed for psychotherapy decreased from $81 to $54 (a 33% decrease). After two decades of fighting for parity for mental health services, therapists who rely on MBHC saw their gross income (after inflation and before overhead expenses) fall 59%. Net income, after overhead, has fallen even more. The U.S. Bureau of Labor Statistics, 2008, provides another measure of the falling reimbursements for mental health compared to physical health care. Table 2 shows that the average psychologist’s income is below nurses and physical therapists, physical health care professions that require only a bachelor’s degree. Master’s level therapists’ average incomes are in the range of auto mechanics and carpenters, occupations that do not require a college degree. This level of reimbursement for psychologists and social workers will not sustain a mental health work force that requires extensive college education with its associated high levels of student debt. Just as there is now a psychiatric bed shortage, there will soon be a shortage of highly qualified professionals for treating mental health patients. The only mental health profession that does not yet show a dramatic income disparity when compared to physical health is psychiatry. Psychiatry has avoided the impact of aggressive insurance management by historically having the highest rate of non-participation on insurance panels, and consequently being able to independently set fees. However, the pattern of nonparticipation has ended, and since 2005, 97.6% of office-based psychiatrists are participating on insurance panels. As would be predicted, their annual income has fallen in the last few years from $180,000/yr. in 2006 to $163,660/yr. in 2008. The relationship between insurance and Medicare is another indication of reimbursement disparity. It is widely considered the norm that insurance pays about 125% of Medicare rates. The Medicare rates are partially based on factors that reflect the necessary level of education and training needed, overhead expenses, and the reimbursement rates needed to sustain an adequate workforce. It is considered the norm that insurance rates tend to follow changes in Medicare with annual adjustments. Indeed, in the Lewin study in 2007, inpatient physical health care was reimbursed at the rate of 164% of Medicare. On the other hand, mental health service reimbursements are not adjusted to keep up with changes in Medicare. In 2009, in Colorado, the typical reimbursement ($72/hr.) for an hour of psychotherapy was 79% of Medicare. Inadequate reimbursements are a result of MBHC determining reimbursements in a different, and unequal, manner than physical health care. In physical health care, insurance and managed care companies examine reimbursements on a regular basis (usually annually), and they make adjustments to keep up with inflation. However, MBHC entities have not made periodic adjustments for inflation over the past 20 years. In fact, decreases in reimbursement are not uncommon, and overall, reimbursement rates have decreased over the past 20 years. There are no indications that any adjustment will be made in the trend of steadily decreasing reimbursements. Without annual adjustments for inflation reimbursement rates will become increasingly inadequate in the coming decades. Insurance companies refer to funds spent on health care as a “medical loss,” and it is usually described as a percentage of the premiums collected. While the amount of the medical loss can be somewhat manipulated through accounting strategies, spending around 80% of premiums is a common estimate (the Patient Protection and Affordable Care Act of 2010 may raise this average ratio a few points above 80% in 2011). Therefore, as a generalization, about 80% of funds are spent on physical health services, and 20% are spent on the administration and profit of insurance companies. In mental health, there is a double layer of administration and profit—after 20% of premium dollars are used for administration and profit, the remaining mental health funds are transferred to a MBHC entity. Some of these are independent entities, and some are subsidiaries of their insurance company. All of the funds transferred to the MBHC are recorded as a medical expense, but in reality, these are profit-making entities with large administrative expenses. The administration and profit of MBHC entities is hidden from the publicly reported medical loss ratios. Determining the administrative and profit expenses of MHBC entities is difficult because this information is proprietary. The best available estimate comes from James T. Wrich, an independent auditor with 32 years of experience auditing dozens of MBHC entities. He reports that he has never audited a MBHC organization that maintained an at-risk contract (could retain unspent dollars as profit) that had a medical loss ratio higher than 55%. Using the starting medical loss ratio of 80% that occurs before funds are allocated to the MBHC entity, and applying the 55% additional medical loss that Wrich found in the best of the MBHCs, the actual medical loss ratio for mental health services is 44%. This is alarming when compared with the 80% medical loss for physical health care. Not only is there a disparity on the side of insurance companies regarding the amount diverted to administration and profit, mental health providers have a greater administrative burden than physical health care. In addition to routine pre-authorization, mental health providers are routinely required to submit to insurance companies lengthy outpatient treatment reports. In Disparity 1.0, insurance discriminated against mental health by neglect. In Disparity 2.0, discrimination against mental health services is a profitable business. The elimination of Disparity 1.0 and the rise of MBHC entities have not improved mental health. Over the past 20 years there has been a slight decrease in the treatment rates of adults impaired by a mental illness. The problem in mental health continues to be under-treatment. In 2006, only 45% of adults impaired by mental illness saw a mental health professional. There is a growing rate of incarceration of people with mental illness. The only increase in treatment of mental illness over these 20 years is the result of a great increase in the number of patients receiving psychotropic medication from primary care providers. In addition, the behavior of the mental health professional organizations and health care economists has been inappropriate to the reality of the situation. Instead of the recognizing and protesting the continuing discriminatory funding of mental health services, mental health advocates and professional organizations have been touting the victory of parity legislation. Health care economists routinely cite the success that insurance companies have had in limiting mental health expenses as if the primary goal of health care policy were to keep funds away from the mentally ill. While the evidence is omnipresent, there has been little public recognition of the impact of Disparity 2.0. What are the likely causes for Disparity 2.0? What are the likely causes of the continued financial discrimination against mental health services? Many psychologists have inaccurately blamed the increase in numbers of Master’s level social workers and counselors for lowering their reimbursements. They believe that their reimbursements are low because, as doctoral level providers, they are being paid the same amount as a Master’s level clinician. The data say different. Master’s level clinicians are paid much worse. If the problem were only a result of market forces, it would not explain why psychiatric hospitals are so underfunded and forced to close. Is the problem that mental health services are not valued by society? It does not seem so. In spite of partisanship, Democrats and Republicans have agreed on parity legislation federally and in most states. Requirements to include mental health services are omnipresent in discussions of reform. National surveys continually show that citizens want mental health services included in health care. Moreover, when insurance companies advertise their benefits, they describe robust mental health services. Is the problem that mental health services are an easy target for managed care cost cutting? This seems to be the most likely cause. There is a long-standing stigma associated with having a mental illness. If a managed care company were to mishandle the treatment of a physical health problem, chances are that the patient would go to the employer and loudly complain about the insurance company. However, if an employee has a problem involving mental health, most employees want to keep the problem and any difficulties away from the employer. The stigma causes patients to keep their complaints in the closet. Indeed, it has always been the intent of MBHC to continue the discriminatory under-funding of mental health services. In 1997, MBHC joined the drive to support parity by asserting that it did not matter if high consumer copayments were eliminated because MBHC could lower spending to offset most of the cost of decreased copayments. In spite of decades of inadequate funding, from the beginning, the MBHC industry openly pledged to maintain the same levels of inadequate funding. Is it possible that better regulation could force health care insurance companies to fund the infrastructure for mental health care? It is hard to imagine how this could work. As for-profit companies, their internal operations are proprietary and not open to public scrutiny so it is difficult to identify or regulate how they discriminate. As long as stigmatized patients are reluctant to complain, mental health will be an easy target. Change in stigmatization happens, but it takes more decades than change in heath care reform. Moreover, the system of “separate but unequal” management is well established. The financial incentives actually encourage the continued discrimination against mental health services. Although it is well established that mental health treatment reduces future health care expenses enough to offset the cost of care, there is little financial motivation to treat mental health in the current system. Almost all health care insurance, with the exception of Medicare, is temporary, with the average beneficiary staying in a plan less than 6 years. The financial incentive is to delay and avoid treatment because chances are that it will be the next company’s problem. Even the destruction of the mental health infrastructure is advantageous to MHBC entities. When psychiatric hospital beds are not available, the MCBH entity can reduce its “medical loss.” The MBHC entity is not held responsible for its role in undermining the mental health treatment infrastructure. The historical facts are clear. No matter how it is regulated, our system of multiple, temporary health care insurers, avoids paying for mental health treatment. In Disparity 1.0, insurers avoided providing services and passed the costs on to the consumer; in Disparity 2.0, insurers have made underfunding mental health services through MBHC entities a profitable adjunct of the health insurance business. Are there systems that do not discriminate against mental health patients? In the U.S., the exception to declining reimbursements for the past two decades is the Medicare system. Medicare reimbursements have risen 21% since 1990. Medicare reimbursements are negotiated transparently under public scrutiny. Professional organizations are permitted to reason with Medicare about the need to reimburse providers adequately in order to maintain the infrastructure of mental health services. The consequence is that Medicare reimbursements have increased with inflation and have not followed the decline of insurance reimbursements. T. R. Reid has studied and compared health care systems all over the world. When asked about mental health disparity in other industrialized countries, he reports it is something that is not even comprehensible in other countries. Other countries treat mental health as just another aspect of health care. Transparent, unified systems do not do not have a history of discriminating against mental health. The best, and maybe the only, hope for reversing Disparity 2.0 is creating a single, unified, and universal heath care system. If the U.S. had such a system, reimbursement rates would be negotiated on a reasoned basis. Because such a system would be transparent, a separate but unequal system for managing mental health services would be exposed to public criticism and would not be tolerated. Such a system would end the disproportionately high number of mentally ill people who lack the means for health care. States would not need to come up with separate funding for public mental health. Health care would be permanent with no uninsured falling between the gaps of temporary insurance. No longer would the mentally ill end up incarcerated or homeless because of an inability to pay for treatment. Solving the U.S. health care problems and mental health care disparities are possible. A single, unified system can be achieved. There is a growing movement, and the potential system designs are diverse. Financing health care using multiple insurance plans is so expensive that it creates an economic bubble that is bound to burst. Once the single, unified system solution is “on the table,” it can only gather support. Reaching a solution for mental health requires joining with the larger growing movement for a single, unified system. Creating a single, unified system is possible. Fifteen states have an active program to create a single system on a state-by-state basis. California has passed legislation for a single unified system through the legislature, but the Governor vetoed it. Vermont passed legislation to examine a single unified system design and is progressing toward a single statewide system. As with parity, single payer is not a quick fix but a long-term movement. The more that mental health advocates can join and promote the movement, the sooner the U.S. will have a quality mental health care system that does not discriminate against the mentally ill. Such a system is an affordable solution for the underfunding of mental health services. Numerous studies have shown that such a system would not cost the country more, but would actually cost less than the current system. It is not too liberal nor is it socialized medicine. There are many variations of a single, unified, and universal system. For example, one variation, Balanced Choice, allows providers to charge more than the standard reimbursement. It combines the market forces that are commonly promoted by conservatives with the social justice goals commonly promoted by liberals. Another model, like Germany, has tightly regulated competing insurance companies in a unified system. Taking the insurance middleman out does not eliminate competition in health care. Proposals for a single system need not be Republican or Democratic; they can be both liberal and conservative. A single system would be good for consumers, providers, and American business. A single system accomplishes the liberal goal of universal access to health care, and it also can accomplish conservative goals. A single unified system is the most fiscally conservative solution, and it has less regulation than the combined regulation of the multiple insurance companies in the current system. A single unified system takes the burden of health care off of employers. It would make American business more competitive globally. It is a “Buy American” plan that would stop the off-shoring of health care. A single system allows full choice of provider as opposed to insurance companies that restrict choice of provider to limited panels. As mentioned above, in the Balanced Choice version there are more market forces than in the current system. Isn’t it time for action? Mental health advocates spent four decades waging a campaign for parity that, in the end, has not changed the disparate funding of mental health services by insurance companies. It is time for a campaign that has the real potential to stop the funding discrimination against mental health. It is shameful that funding for mental health services has fallen so drastically while the professional organizations have not even spoken about it. The American Psychological Association has been frightened that if it mentions the word “reimbursements,” it will be accused of antitrust activity. It also fears that if it advocates for psychologist’s reimbursements, it might lose its 501(c)(3) status. It is possible that the other professional organizations have had the same fear. These fears are an indication of an exaggerated legal concern over protecting the organization’s assets and a loss of a sense of mission. Publicizing Disparity 2.0 is neither a violation of antitrust or 501(c)(3) regulations; it is reporting the truth and exposing discrimination. It is imperative to the mission of the mental health professions to publicize the needs of the mental health patients who they serve. It is time for the professional organizations to step up. Advocating for reform begins with articulating the facts of Disparity 2. Individuals can educate others to the realities of Disparity 2.0 and demand that the mental health advocacy organizations break their silence about Disparity 2.0. Individuals may also join organizations that advocate for real reform. It is time to renew the parity alliance to publicize Disparity 2.0 and work toward a single system that achieves real parity. In Colorado, advocates may join the movement for a single, unified system that would adequately fund mental health by becoming a member of Health Care for All Colorado, www.HealthCareforAllColorado.org. Physicians for a National Health Program, www.pnhp.org, and Healthcare-Now, www.Healthcare-Now.org, are organizations that advocate nationally for a single, unified system of health care. Many states have groups of consumers and providers who have formed similar groups. This article is available at www.ivanjmiller.com/disparity_action.html. This article is a follow-up to “Mental Health Disparity Version 2.0: An Open Letter About Financial Discrimination Against Mental Health Services,” Miller, I. J. (2009), available at www.ivanjmiller.com/disparity_article.html. This paper was made possible by a grant from the James M. Ragen Memorial Fund, Private Client Reserve, Oak Park, IL. Copyright permission — This article may be reproduced or distributed both electronically and in hard copy as long as it is reproduced in its entirety and the authorship is acknowledged. 2. Hodgkin, D. & Karpman, H. E. (2010) Economic crises and public spending on mental health care. International Journal of Mental Health 39(2), 91-106. 3. Miller, I. J. op. cit. 4. American College of Emergency Physicians. Psychiatric and Substance Abuse Survey 2008. 5. Lewin Group. (2007). Final report to the Colorado Blue Ribbon Commission on Health Care Reform, 2007, http://www.colorado.gov/cs/Satellite/BlueRibbon/RIBB/1207055681539. 7. Denver Post, Augè, K. Psyc. Units Shutting Doors, 1/25/09. 8. Glied, S. A. & Frank, R. G. (2009). Better but not best: Recent trends in the well-being of the mentally ill. Health Affairs, 28(1), 637-648. 9. Frank, R. G., Goldman, H. H., & McGuire, T. G. (2009). Trends in mental health cost growth: An expanded role for management? Health Affairs, 28(3), 649-659. 10. Herz, G.H. (2010). Reimbursement for psychologist’s services: Trends, impact on access to psychologists, and solutions, Interdivisional (39/42) Task Force on Managed Care and Health Care Policy, 9/09, revised 2010. http://drherz.us/blog42/?p=311. 11. Miller, I.J. (2009) Boulder, Colorado community survey of reimbursements for 14 of the most common insurance plans. The annual income was calculated assuming that a psychotherapist would have 30 billable hours a week of patients; work a 48 week year (no pay for sick days, family emergencies, holidays, overtime, or professional training); have no loss due to uncollected fees; and have $42,000 of office expenses. It should be noted that the resulting annual incomes did not include employer paid health insurance benefits. 17. http://www.bls.gov/oco/ocos181.htm, Mean hourly wage, $19.61, at 2080 hrs. /yr. equals $40,788 for full time annual income. 20. http://www.bls.gov/oco/ocos202.htm, mean hourly wage, $18.72, at 2080 hrs. /yr. equals $38,937 for full time annual income. 21. Glied, S. A. & Frank, R. G. op. cit. 22. Miller, I. J. op. cit. 23. Lewin Group. op. cit. 24. The Patient Protection and Accountable Care Act of 2010 calls for large group plans to have a medical loss ratio of 85% and for small groups and individual plans a medical loss ratio of 80%. It is possible that after 2011, the average medical loss ratio would be above 80%. 25. Wrich, J. T. (2009). Brief summary of audit findings of managed behavioral health care services, James T. Wrich & Associates, 3674 Mathias Ct., Verona, WI 53593. 26. This figure was determined with the following calculations: 100% premium dollars x 80% medical loss ratio x .55% additional MBHC medical loss ratio = 44% actual medical loss ratio for mental health services. 27. Glied, S. A. & Frank, R. G. op. cit. 28. Miller, I. J. (1997). Beware of a Trojan horse from managed care: Dangerous provisions in parity legislation. The Independent Practitioner, 17(3), 138-142. 29. Reid, T.R. (2009). The healing of America: A global quest for better, cheaper, and fairer health care. The Penguin Press: New York p.186. 30. Frank, R. G. & Garfield, R. L. (2007). Managed behavioral health care carve-outs: Past performance and future prospects. Annual Review of Public Health, 28, 303-320. 31. Reid, T. R. op. cit. 33. The author is Treasurer of Health Care for All Colorado, one of the fifteen states. Health Care for All Colorado, P. O. Box 280767, Lakewood, CO 80228, www.healthcareforallcolorado.org. 34. Miller, I. J. (2006). Balanced Choice: A Common Sense Cure for the U.S. Health Care Systems. Authorhouse: Bloomington, IN www.BalancedChoiceHealthCare.org. 35. Miller, I. J. (2010). Which Health Care Reform Proposal is Good for Business? Single Payer is the Surprising Clear Winner, Health Care for All Colorado, http://www.healthcareforallcolorado.org/?p=79&ID=1587&d=1.